This style uniform was used between 1928 and 1947. It was worn by an intermediate scout – the rank between “Brownie” and “First Class” Girl Scouts. Originally, there was a red scarf worn with it, and other accessories could include a belt, a dark green basque style hat, and Girl Scout socks. The proficiency badges are worn on the sleeve. This uniform was manufactured before WWII as the front zipper was replaced with buttons during WWII. It was worn by Carol (Melby Hastings) Fingerson in the mid 1940s. 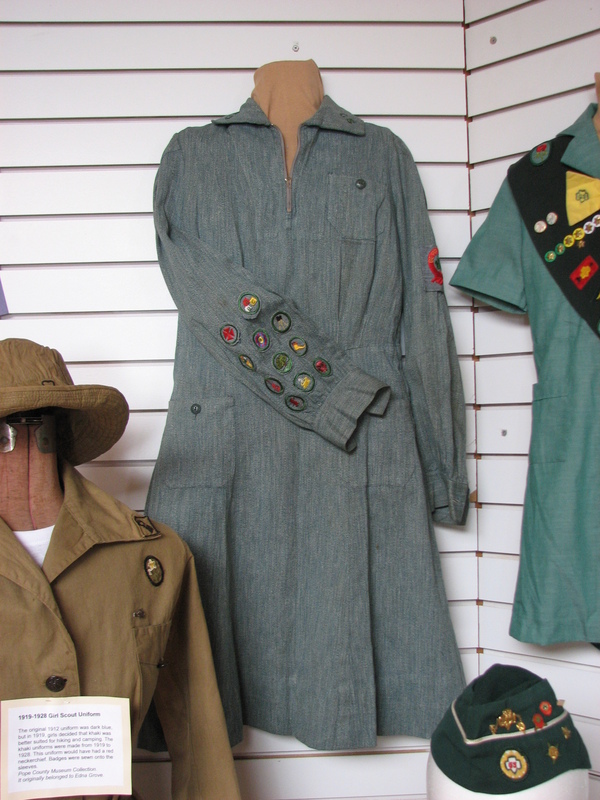 This entry was posted in Collection Notes, Museum updates and tagged 100th anniversary, Girl Scout, Girl Scout Uniforms, Glenwood Girl Scouts, mid 1940s, Pope County Museum, proficiency badges, Vintage Girl Scout Uniform. Bookmark the permalink.